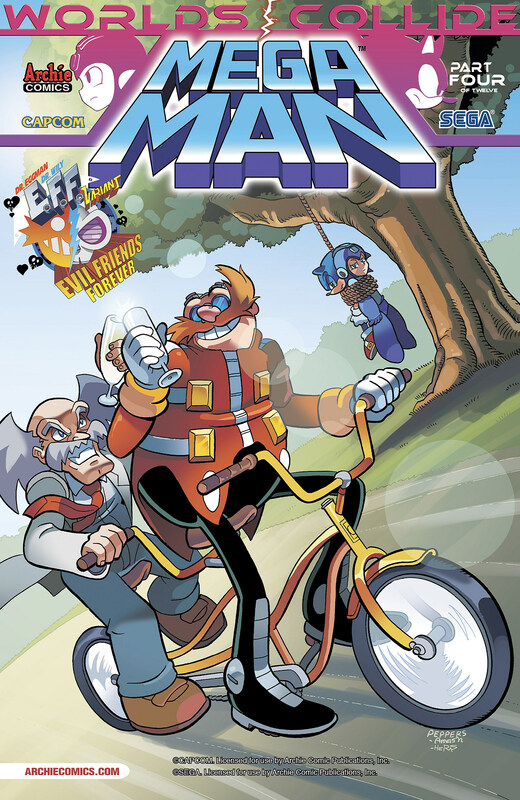 We've spent a pretty hefty amount of time thinking about the upcoming crossover between Archie's Sonic the Hedgehog and Mega Man comics, but there's one sinister possibility that we never considered: the dire, unstoppable evil of a bicycle built for two! It is exactly that terrifying possibility that will be coming to life on the "Evil Friends Forever" cover of Mega Man #25 by Jamal Peppers, Gary Martin, Matt Herms and Patrick Spaziante, in which Drs. Wily and Robotnik Eggman celebrate a triumph over their foes with a trip through a park that can only be described as bromantic. Check out the full cover and solicitation info after the cut!It's worth noting that in true villainous form, Eggman and Wily are engaging in some truly villainous behavior that readers should definitely not imitate. Listen, kids, even if you're super stoked from tying up your nemeses and hanging them from a tree like a couple of surprisingly vocal piñatas, you should never mix champagne and bicycling-built-for-two. It's a recipe for disaster. "When Worlds Collide" Part Four of Twelve: It's Sonic versus Mega Man – Round Two! Celebrate 25 issues of Mega Man with the throwdown brawl to end all throwdown brawls! The Blue Bomber has the home field advantage this time – can Sonic keep up in this unfamiliar city? Meanwhile, Drs. Eggman and Wily make their boldest move yet in their master plan! This milestone issue marks the dramatic conclusion to the first act in the biggest crossover story of 2013! Featuring a stunning gatefold cover by Sonic/Mega Man art legend Patrick Spaziante, and a special "E.F.F. (aka Evil Friends Forever) variant" featuring Drs. Eggman and Wily on a (presumably evil) bicycle built for two!